Xiaomi has confirmed that something related to its Mi 8 series of smartphones will be coming to China today. Rumors have claimed that this phone would take on a very affordable price tag while busting out premium features like a fingerprint sensor in the display and the Qualcomm Snapdragon 710 processor as seen on the Mi 8 SE. Some of have hoped strongly that this would be the case, but they may have also done so wrongly. 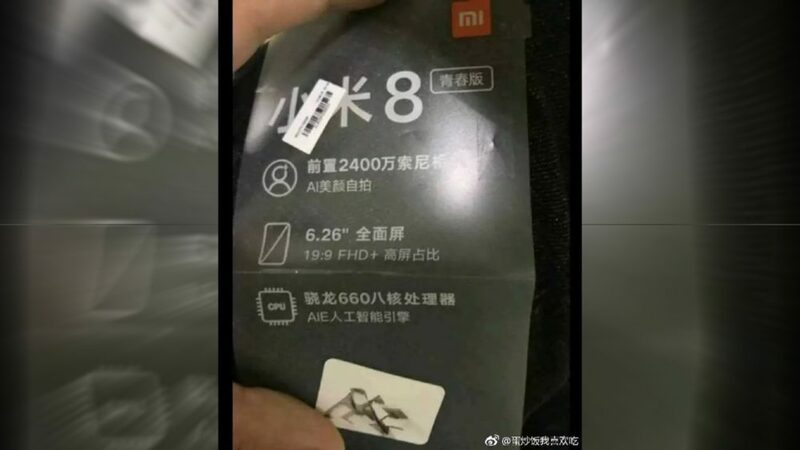 An image has leaked of the in-box screen protector for what we’ve been calling the Xiaomi Mi 8X. However, if we’re to believe what we see, the device will actually be named the Xiaomi Mi 8 Youth Edition. Some of the specs include a 24-megapixel selfie camera with AI beauty features, a 6.26-inch 19:9 full HD display and an older Snapdragon 660 chipset — not even the newer Snapdragon 670 mid-ranger SoC. The highlights don’t seem to include any talk about fingerprint sensors or, for that matter, facial identification, though that conspicuous white sticker at the bottom of the protector may betray something. We’ll learn soon enough.